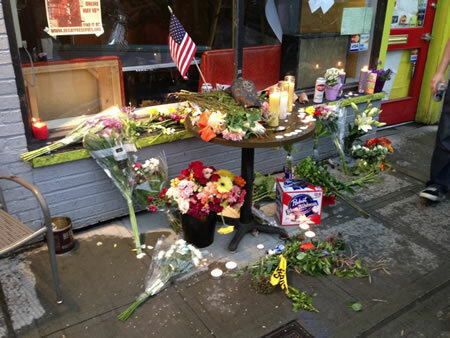 We are deeply saddened by the senseless loss of life that took place at Cafe Racer on Wednesday morning. Many among us knew the victims personally; it was at Drew’s urging, in fact, that the Racer Sessions begun. We will miss him and the others who lost their lives, immeasurably. In their honor, we will still meet on Sunday evening. Cafe Racer, Seattle, Wednesday, May 30 from Doug Plummer on Vimeo. The wake at Cafe Racer, where 4 people were killed on Wednesday, May 30, 2012. The GRAMMY-nominated Clayton Brothers Quintet was formed in 1977 by brothers John and Jeff, and while their paths sometimes diverged, the brothers continue to share a common musical vision. The quintet also consists of John’s and GRAMMY-nominee Gerald Clayton on piano, Obed Calvaire on drums, and Terell Stafford, a highly regarded trumpeter and band-leader. Our thoughts go out to all of the families of the victims of today’s shooting at Cafe Racer and downtown Seattle. There was a shooting this morning at the popular jazz venue Cafe Racer. News reports have two people confirmed dead and three injured and taken to Harborview. Two people were killed and three others injured in a shooting at a University District cafe on Wednesday morning. Police said a man opened fire at Cafe Racer, located at 5828 Roosevelt Way NE, at approximately 11 a.m.
Two men were fatally shot, and three others were wounded. Officials said one of the wounded victims is being treated for life-threatening injuries, and two others sustained serious injuries. The gunman remains at large. Police said he is a white man between 30 and 40 years old. He is believed to be 6-foot-1 and of thin build with curly light brown hair and a goatee or a beard. He was last seen wearing a white and brown plaid shirt and dark pants, and was seen headed north as he ran from the scene. Officers have cordoned off the shooting scene and are searching a wide area for the armed man. It was not known what prompted the shooting, and no information about the victims has been released. Nearby Roosevelt High School has been placed under lockdown as a precaution. Greenlake Elementary School, Eckstein Middle School, Ravenna-Eckstein Community Center and Bryant Elementary School were sheltering in place. The Bellevue Jazz Festival, which runs through Sunday and features national touring acts, regional players and local student bands, kicks off Wednesday, May 30, in six venues. Of particular interest over the four days are headliners The Clayton Brothers (Thursday), featuring bassist John Clayton, who books the Port Townsend and Lionel Hampton jazz festivals); funky keyboard ace Booker T. Jones (Friday), of the great ’60s group Booker T. & the MGs; and jazz flutist Hubert Laws (Saturday). 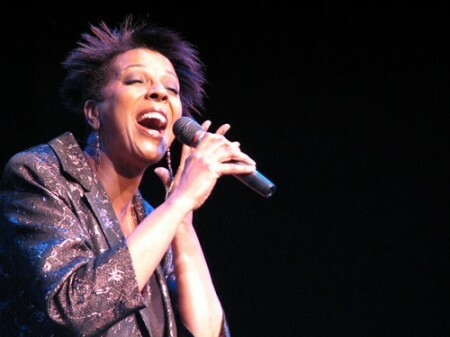 Also notable Saturday is a rare performance by Seattle vocalist and former club owner Patti Summers. On Sunday, nationally-known pianist George Colligan plays with Seattle trumpeter Thomas Marriott’s group Human Spirit and a program at Bake’s Place celebrates “rising stars” with the release of the latest KPLU “School of Jazz” CD, a compilation of student ensembles. Admission to Bellevue Jazz Festival shows range from free to $34; headliner packages are available for $78 (800-838-3006 or bellevuejazz.com). Bremerton saxophonist Mark Lewis continues his Friday jazz series through June, performing each week with a different Northwest musician. The shows are an easy walk from the Seattle/Bremerton ferry terminal. The music is on the main floor in the restaurant. All ages. No cover. Cornish College of the Arts announces the appointment of jazz French hornist Tom Varner to the position of Assistant Professor of Jazz Performance. Mr. Varner is internationally known as the foremost jazz French horn player of his generation as well as a gifted composer. 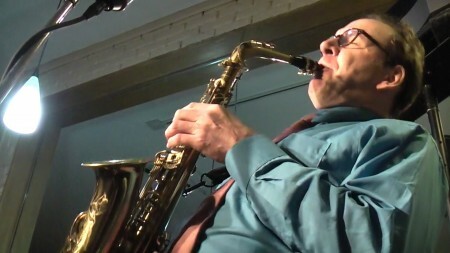 As well as performing and recording with his own groups, Varner has worked with such illustrious artists as George Gruntz, Steve Lacy, Reggie Workman, Bobby Previte, John Zorn, Gil Evans, the Mingus Orchestra, Jane Ira Bloom, La Monte Young, Jim McNeeley, George Schuller, Butch Morris, McCoy Tyner, Quincy Jones, and Miles Davis. He can also be heard on over 70 CDs. Mr. Varner joins over twenty other talented artists on Cornish’s jazz faculty including composers Jim Knapp, Jovino Santos Neto, and Wayne Horvitz, vocalist Johnaye Kendrick, pianist Randy Halberstadt, and bassist Chuck Deardorf. Founded in 1974, the Cornish jazz program is one of the oldest and most prestigious jazz programs in the nation and boasts such distinguished alumni as Myra Melford, Eyvind Kang, Briggan Krauss, Brad Shepik, and Dawn Clement. Cornish has a storied tradition of attracting ground-breaking artists to teach in the jazz program over the years including Gil Evans, Gary Peacock, Jay Clayton, Michael White, Anthony Braxton, Jerry Granelli, Carter Jefferson, and Art Lande. More recently this has also included visiting artist residencies by Rudresh Mahanthappa, Butch Morris, John Hollenbeck, Allison Miller, and JD Allen. The 2012 edition of the Bellevue Jazz Festival kicks off tomorrow night, Wednesday, May 30 and runs through Sunday, June 3. This year’s headliners include The Clayton Brothers, organist Booker T. Jones and flutist Hubert Laws. In addition to the festival’s headliner performances, more than 40 free shows by top regional jazz artists and talented student musicians will take place throughout the weekend in restaurants, bars, and cultural spaces in downtown Bellevue. All headliner performances are held at the 410-seat Theatre at Meydenbauer Center, one of the Pacific Northwest’s premier performing arts venues. Thursday, May 31, 8:00 p.m.
Friday, June 1, 8:00 p.m.
Saturday, June 2, 8:00 p.m.
For more information, and for a complete schedule, visit the Bellevue Jazz Festival website. Jargon is a new, modern-jazz quartet with Bryan Smith (saxophone), Gregg Belisle-Chi (guitar), Isaac Castillo (bass) and Max Wood (drums). The group focuses on original compositions, influenced by Kurt Rosenwinkel, Avishai Cohen, Chris Potter and Bill Frisell. Here is a short video of the group sitting in at the Owl ‘n Thistle last night. to me. The service that evening was impeccable and I enjoyed one of their tasty cuisine specialties, a House Chop Salad with peppermint tea. Famed jazz chanteuse Dee Daniels gave a truly stellar performance, delivering her smokin’ brand of gospel and blues-infused vocals to an enthusiastic sold-out crowd. Her outstanding band was comprised of bassist Chuck Deardorf, drummer D’Vonne Lewis, saxophonist Brian Kent and pianist Tony Foster. Dee’s 90-minute set spanned a variety of styles such as Frank Sinatra’s “That’s Life”, Earth, Wind and Fire’s “You Can’t Hide Love”, and the Billie Holiday classic “Love for Sale”. The musicality of Dee Daniels and her fabulous group was truly an inspiration in such a splendid setting as the new Bake’s Place in Bellevue’s “South Side” (as Dee put it). I was immediately taken by the hushed, intimate ambiance of the room with its general layout being very conducive to superior listening. Looking out of the beautiful floor to ceiling windows, one saw a gorgeous patio with colorful umbrellas, perfect for accompanying guests in the warm spring and summer days. I was equally impressed with the overt friendliness of their staff as well as the bountiful, succulent menu selections. Bake’s Place owners Craig and Laura Baker have done a fabulous job ushering in Bellevue’s newest venue and their eclectic range of live music offerings is sure to entice many concert goers throughout the region. Saxophonist Ian Hendrickson-Smith, who has been to Seattle a number of times with the wildly popular soul group Sharon Jones and the Dap Kings and well as jazz gigs with his own group, returns this weekend for two shows Friday – Saturday. Alto, Tenor, Baritone Saxophonist and Flutist Ian Hendrickson-Smith has been and continues to be one of the most sought after musicians in New York City. Mostly noted for his remarkable tone, soulful approach and blues driven melodies he’s been reaching audiences world-wide through numerous recordings and live appearances. Born in New Orleans, Ian Hendrickson-Smith began his professional music career in 1996, after four years of studies at the Manhattan School of Music. From 2004 to 2010 Hendrickson-Smith maintained an intense recording and touring schedule as a member of Sharon Jones and the Dap-Kings. He’s performed on virtually every major US late night TV show and has played the worlds premier stages. Ian is currently working towards opening a jazz club in NYC. Hendrickson-Smith has worked and/or recorded with: Sharon Jones and the Dap-Kings, Amy Winehouse, Al Green, Rufus Wainright, The Roots, Bob Dylan, Mofro, Robbie Williams, Boyz 2 Men, St Vincent, The Heavy, Michael Buble, The Charles Mingus Big Band Workshop, Phillip Harper, Etta Jones, David Hazeltine, Danny Moore, The J.B.’s (Fred Wesley and Pee Wee Ellis), Adam Scone, Lee Fields, Mark Ronson, David Sanborn, The Hotpants, The Macktet, The Uptown Quintet, The Night Crawlers, and more.